SpaceX president Gwynne Shotwell recently did a TED talk that included a slide showing three designs for the BFR. The original from 2016 is on the far right of this image, and is the largest and oldest concept. In 2017, the design was revised to be smaller and far easier to build. This version can also do airline service anywhere in the world near an ocean in less than 45 minutes. What is noteworthy is the middle version. This is simply dated 2018, and shows a length almost exactly half-way between the original 12 meter diameter vehicle and the revised 9 meter diameter. This seems to be due to refinement of the aerodynamic design of the nose and wing surfaces. The wing roots are much longer along the side of the fuselage, although that seems to be partially due to the slightly different angle in the renderings. Also included this time are four small landing legs, which protrude past the booster BFR stage. They simply do not appear in last year's version. In the original, there are three retractable legs in fairings, two of which are part of the entry shield. The engines in the original design protruded past the back of the fuselage in the original design. In the 2017 revision, the engines are completely covered by the aft fuselage skirt. It is possible that the extended landing legs allow for the engines to protrude slightly again. It may also be a consolidation to landing on Mars or other unprepared surfaces like the moon. There are two great fears in landing on unprepared surfaces with rockets, such as the moon and Mars. One is that rocks can be kicked up by the exhaust and damage the engine bell. This did happen with one of the Apollo landings. While Apollo used a different engine to return to space, the BFS is stuck with the same exposed engines for ascent. The second factor is that these engines are basically blow-torches that put out exhaust at hypersonic speeds. As such, they can take the dirt of the moon or Mars and essentially stir it like liquid while landing. After landing, the unsettled dirt can settle around the foot-pads, essentially burying them under the surface. This is one of the reasons the Curiosity lander used a jet-pack on a tether to lower the rover to the surface - to keep those engines as far away from the ground as possible. While less of an issue for lunar landing due to lower thrust requirements, it may be an issue for Mars. In both cases, getting landing pads built will be a very early priority to avoid throwing rocks at whatever you had landed prior to that point. Early landings may avoid the issue by landing in craters. The four leg configuration also means another slight design difference from last year. Since the legs protrude, the back-to-back configuration for one vehicle to refuel another on orbit will have to be done at a slight angle to allow the legs of each vehicle to slide past each other. The configuration changes imply they have stretched the propellant tanks slightly in the new design. This would be good, as the reduction in diameter between 2016's twelve meter diameter and 2017's nine meter diameter, all else being equivalent, reduces both the propellant and pressurized crew compartment volumes by 70 percent. The revised design slides form 2017 show only a 43 percent reduction in propellant load by mass, however. 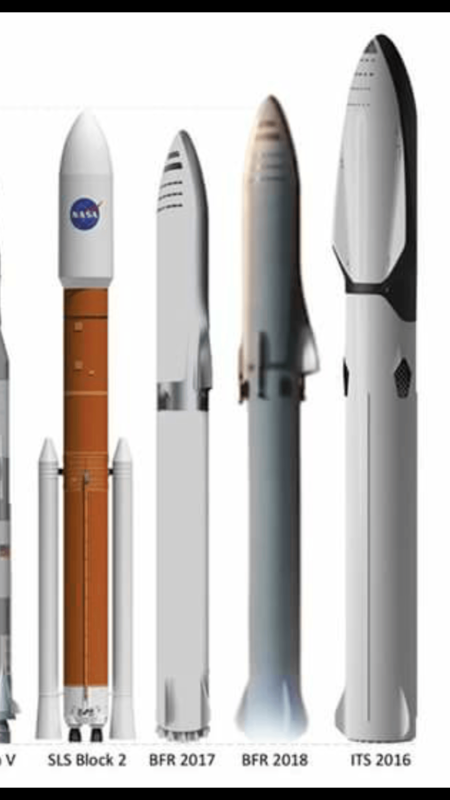 The revised design is much longer than a 25 percent reduction in length, and the propellant tanks appear to be more efficiently designed in terms of capacity than the 2016 design. A recent photo analysis of the machine used to make the fuel tanks of both stages shows that the interior diameter is slightly over nine meters, instead of the exterior as originally expected. Due to economies of scale, every little addition to the tank volume dimensions has a substantial impact on payload. The 2017 design also mentioned 40 crew cabins, as opposed to the original crew of 100 people. While you may well have two to a cabin, the substantial reduction in volume would make things cozier. While Elon Musk wants BFR going to Mars robotically in 2022 and with a crew in 2024, Gwynne sees humans on mars by 2028 as a "for sure" outcome. Near term projects mostly involve short vertical hops, with longer term work on flying up, then using the engines and remaining fuel to slam into the atmosphere to simulate reentry from deep space. This is very critical. Vehicles arriving at these speeds heat up with the cube of velocity, so little changes in speed can make the entry fatal. This, in turn, dictates not only the flight time to and from Mars, but the payload capacity allowed for both flights.